What and where is it? The Cordillera Huayhuash Circuit is an 8-12 day and 120 km trek circling around the entire Cordillera Huayhuash in the Peruvians Andes, the highest mountain range in the world outside the Himalayas. You will get to the highest summits of the world like the Yerupaja (6634m), the Siula Grande (6344m) or the Jirishanca (6126m). Starting from the city of Huaraz in Peru, the whole trek is above 4000m in altitude. There is a total of 7 passes above 4800m and 2 passes above 5000m. They are higher than any summit in Europe. You will hike an average of 15-20km per day in a very remote area. Conditions can be difficult and the weather is fast-changing. Within 12 hours, you can experience sunshine, snow, rainfalls and blizzards with far below zero temperature altogether. You will be camping under the stars, drinking fresh water from the glaciers and experience the beauty of the mountains like never before. Be ready to see snowy peaks beyond the clouds, glaciers, waterfalls, crystal-clear mountain lakes, 360 degrees panoramic views and the majesties Andean Condors if you are lucky. You will trek in a group of maximum 15 people which will become good friends by the end of the circuit. The team consists of a professional guide, a cook and a donkey driver. Your days start with the sun, we wake up between 5am and 7am. We finish the days with the most breathtaking sunsets and go to bed early between 8 and 9pm. You will be walking between 6 to 9 hours per day, and even more if you decide to go for extra passes to get even more amazing mountain views. Fly to Huaraz: There is only one flight per day. We can organize a pick-up from the airport in Huaraz to your hotel. Take a bus to Huaraz, it takes around 8 hours: There are many departures per day, from 10 am to 11 pm. Most bus companies offer 120 degrees seats, including a snack and clean onboard bathroom. We pick you up at the bus terminal in Huaraz. What is included in the trekking price? Of course we can include more services in a tailor-made program and book your bus tickets, hotel rooms, etc. When is the best trekking season? 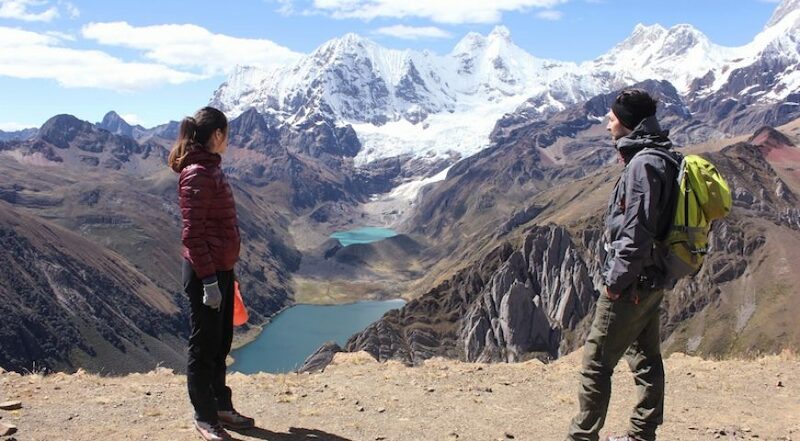 The best trekking season in the Andes is from May to October, with rainy season in between. It is usually sunny and warm during this time. Due to the altitude, the nights can be quite cold (to minus 5 ° C). Is this the right trek for me? Requirements are surefootedness, a head for heights, a good physical condition, team spirit and willingness to leave your comfort zone. You should have hiked in the mountains already. In preparation for this trip, we recommend conditioning and extensive walks. There are many high passes, some over 5’000 m. The hiking times per day are between 6 to 9 hours and can vary depending on the condition of the group and weather. The height differences to be overcome in the climb are a maximum of 900 m, in the descent maximum 1150 m per day. When is the next group departure for the Huayhuash Trek? All our group departures are listed on our website. Depending on demand, the dates may change or more may be added. If you don’t find a suitable date, contact us! As long as there is no fixed booking for an advertised trip, we can adjust the date and hope that more customers will join. We can also organize private, individual tours! Sign up for the AndinoTrek Newsletter to receive news, updates and tour offers by email.